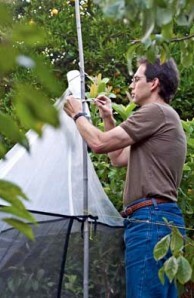 Entomology Curator Brian Brown sets up a Malaise trap in a backyard in Monrovia, Los Angeles County. The trap has yielded new and rare insect species. His advocacy of “backyard diversity” isn’t new. Brown first became interested in it during the Museum’s Spider Survey, which began in 2001 and invited Angelenos to bring arachnids to his department for an informal citywide inventory. 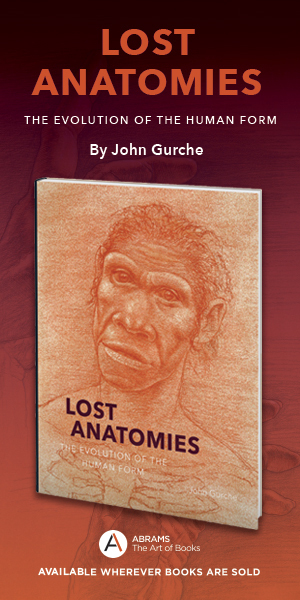 The survey found that the local eight-legged fauna had as much in common with Europe as with the surrounding wild lands. It encountered new species, new distribution records, and even the first examples of the now common (but then undetected) South African brown widow spider. As natural habitats increasingly become replaced by suburban development, the insect and other animal life found in gardens and other altered landscapes are increasingly the only wildlife people encounter. But if they look closely, this fauna isn’t an impoverished one. Introduced insects mix readily with native species able to thrive in the new, relatively water-rich and lush backyard habitats. When Brown talks about backyards, he means two things: the area in and around our homes, and the area in and around Los Angeles. To that end, the Entomology Department recently received two small grants from the Santa Monica Mountains National Recreational Area to conduct terrestrial invertebrate inventories. One grant will incorporate Malaise trap collections of hover flies, brightly colored wasp and bee-mimicking flies that are important pollinators. The other supports data mining inside the Museum—essentially a hunt for specimen labels from the Santa Monica Mountains that have been collected over decades.